iPod | Keep It Up, David! These Songs Helped Me Power Through My Races – They’ll Help You Smash Your Workouts Too! 3WAYS2 Pump Up Your Running Playlist… with Songs that Have ‘Run’ in the Title! I know I’m not alone when I say that music really helps push me through my workouts. My iPod and earbuds are at the top of my workout necessity list (along with water and heart rate monitor). It’s been a while since I’ve shared the songs that keep me moving, and I’ve been loving my workout playlist lately, so… here are some of my favorites! I had to buy a new iPod. 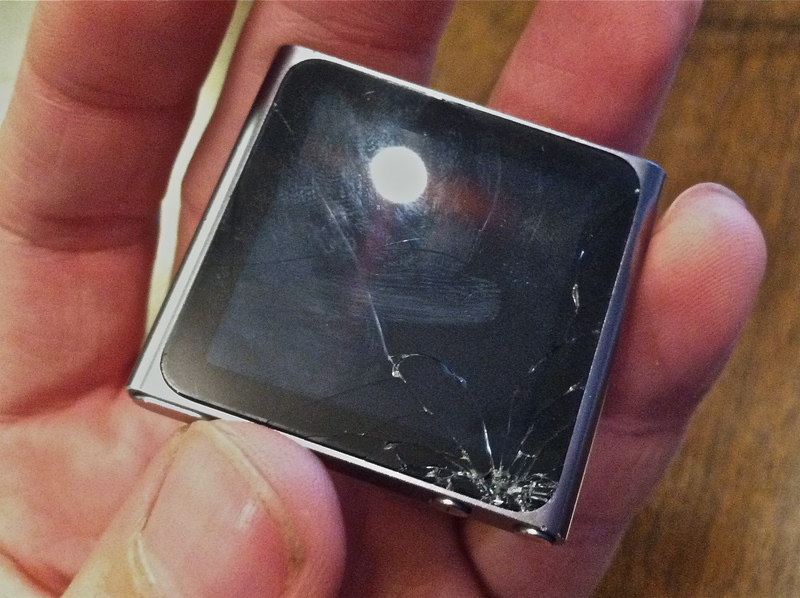 I last wrote about my iPod in March, when I dropped it on cement and cracked the glass. My iPod rebounded from that trauma, and the cracked screen proved not to be a fatal wound, just an unsightly cosmetic one. What did my iPod in was some sort of faulty, damaged battery. I didn’t get the specifics, nor did I care – what was important was that I got a new iPod, and, once again, all is well in my mobile music world. The technology is my life is crumbling around me, but I’ll survive. Exhibit A: Padlock. I have a cheap little padlock that I use at the gym to lock up my stuff, and the other day, it wandered off. It’s nowhere to be found. It’s not the end of the world – I only spent $6 on it, and I’ll swing by the store and spend another $6 on a new one, but it’s still annoying. Especially since, in all likelihood, the minute I come home with a new one, the old one will miraculously appear. Exhibit B: iPod. I go through iPods much quicker than any normal person should. I use mine all the time – for all my workouts, and whenever I’m driving. I’m currently on my fourth iPod in a year. I can’t remember what happened to the first – I think I lost it. The second was a Shuffle that I left on an airplane (that wasn’t the end of the world, I didn’t really care for the Shuffle anyway). The third was a Nano Touch that stopped working altogether. 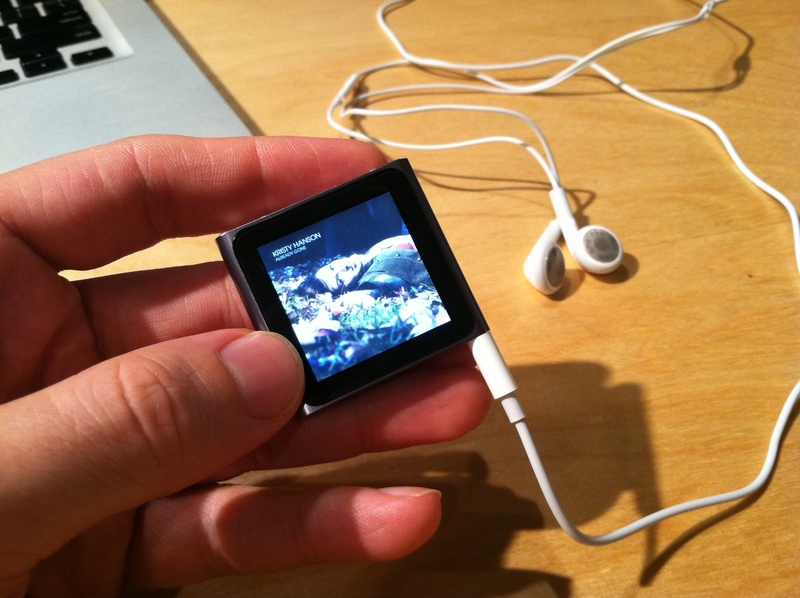 I took that one to the Apple store, and they replaced it, free of charge, with the fourth, my current Nano Touch. D’oh! Thankfully, it’s just the glass that cracked – the screen itself is fine and readable and the iPod still works. 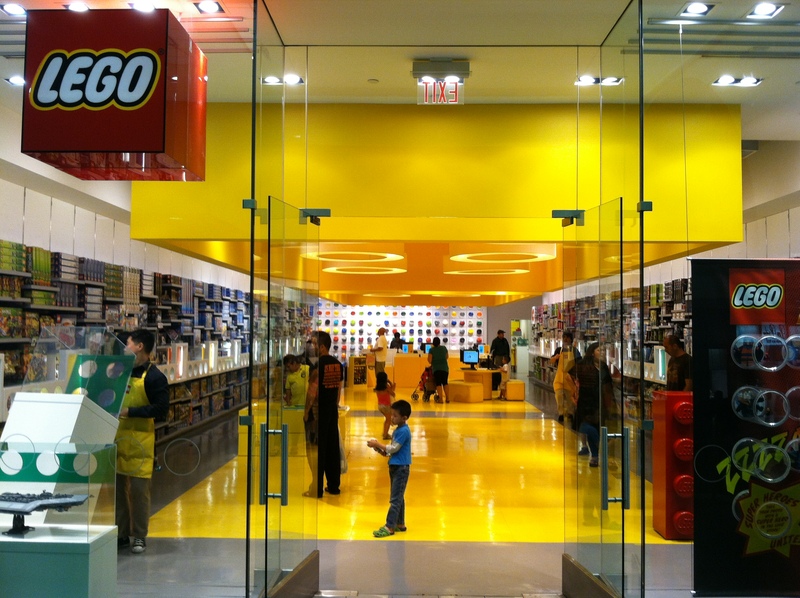 I’m not going to rush out to buy iPod #5, mainly because I don’t want to spend the money. I plan on nursing this injured baby as long as I can, hoping, the entire time, that its injuries are indeed just cosmetic and not fatal. Exhibit C: Microwave. My microwave stopped working. Microwaves are one of those appliances where replacing them are often times more cost-effective than servicing them, but my microwave is a built-in microwave/hood dealie above my stove. I was lamenting to my sister about my broken microwave, and she goes “I thought hippie healthy people don’t use microwaves.” I laughed, but I do use a microwave regularly: reheating leftovers, making oatmeal, cooking frozen veggie burgers when I’m too lazy to use a skillet. I’ve gotten really cook at cooking eggs for breakfast sandwiches in the microwave – and that’s one of my favorite grab-and-go morning meals. A comparable replacement microwave would cost in the neighborhood of $300 – a lot of money that I don’t have. So I started doing research. After scouring the interwebs and taking note of my unit’s symptoms, I was pretty confident in my own diagnosis: My microwave had a faulty/broken door switch. 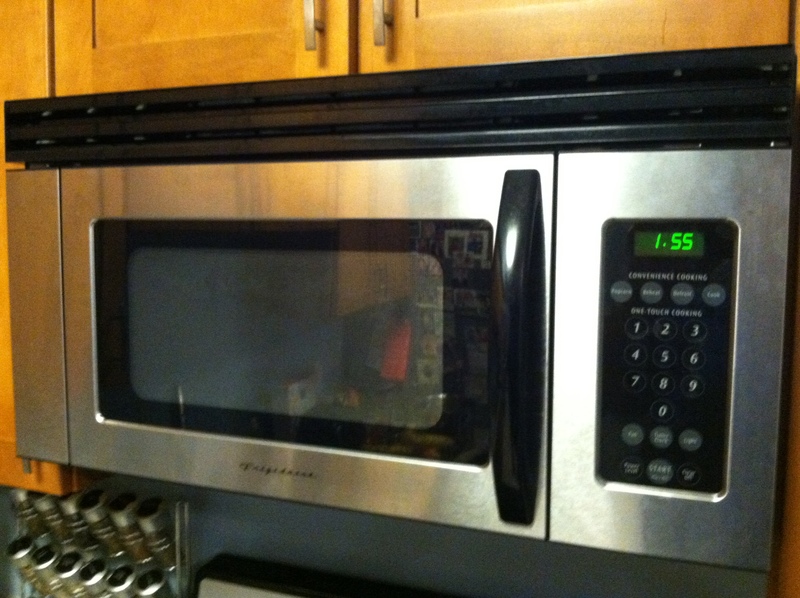 All microwaves have door switches – they’re sensors that tell the machine the door is closed. The microwave won’t turn on if the door is open, so a door switch is a key microwave component. I live down the street from a Sears, and they helped me identify which door switch I needed. They also recommended a new fuse, in case that was blown. They couldn’t get the parts in stock for a week, so I didn’t order them – I figured there had to be some place in Los Angeles, the second biggest city in the country, that had these parts in stock. Sure enough, I found a place that did. The very next day I had a new door switch and a new fuse, and I was determined to make the repair myself. With help from the interwebs, I figured out how to take my microwave apart, and I found the door switch in the microwave’s innards. And this was where I encountered my first problem: my microwave has two door switches, and I didn’t know which was the broken one. I don’t own the equipment (an ohmmeter?) to test them, either. Then I realized that even if I knew which door switch to replace, I was lacking some tool that was needed to remove them from their internal homes. I ended up calling a repairman from Craigslist, who came the next morning, charged me $80, swapped out the fuse and the door switch, and got my microwave working again. Add in the $65 I paid for the parts, and I spent $145 – significantly less than a new microwave, and significantly less than having a professional diagnose the problem (I had priced that out, and it would’ve cost $139 just to get a technician through the door, before parts and labor). I’m a little bummed that I wasn’t able to actually fix my microwave myself, but I’m incredibly proud that I correctly identified the problem, ordered the right parts, and saved myself $150 (at least)! A few updates before signing off: Thank you all for your input on my rest day dilemma – I ended up taking a rest day on Thursday, and I’m glad I did. I’m off to the gym now to hit the weights for the first time in almost a week – looking forward! Lastly, A big thank you to everyone that’s donated to my two upcoming stair climb fundraisers! Between the two events, over $1,000 has been raised – a figure that completely bewilders me! I’ve upped my goals multiple times for each event, and there’s still lots of time for you to get in on the action. All the money goes to one of two great charities: Whaley Children’s Center or the American Lung Association, and every little bit, even $5 or $10, really makes a difference. Have you donated yet? CLICK HERE TO READ ABOUT MY STAIR CHALLENGES AND MAKE A DONATION! Good question, reader, good question (that seems like a polite way to start). The 90 minutes she’s referring to was my Wednesday workout, which I mentioned in this post. And, to answer the question, there’s a couple things that keep me moving. One thing is that I sometimes set smaller goals for a given day’s workout and then end up exceeding them, which makes me feel fantastic. Yesterday, for example, my goal was to do 45 minutes of toning and then 20 minutes of cardio. As I was working my way through the toning, I set a little plan for which machines I’d use to get me to 45 minutes. When I hit 40 minutes, I saw that the last 2 machines I wanted to use were in use, and instead of waiting around, I thought ‘screw it’ – and jumped on the elliptical. I felt really good on the elliptical, and when I hit about 18 minutes, I decided that I could keep this up, and bumped my target time to 30 minutes instead of 20. 30 minutes then turned into 40 minutes, and at 40 minutes, I knew I was only 4 minutes away from the machine turning off (because the ‘Quick Start’ program on the machine is a 44 minute program), so I decided I could finish strong. A ninety minute workout seems daunting, that’s for sure. But a shorter workout doesn’t, and when I push myself past my goals, there’s a really incredible sense of accomplishment. Another thing I do is constantly switch up my workouts to I don’t get bored. If I work out 5 times in a week (which has been about average for me the past couple of months), there’s a good chance that none of them will be the same workout. Right now I alternate between classes at Slimmons, going for a jog, doing cardio at the gym, lifting weights at the gym, and for the last month or so, I’ve been taking a Latin Jam dance/aerobics class at another gym (it’s on my list to blog about). Very rarely the same thing twice in a row. Taking a class almost always results in a good workout for me, because I’m naturally a competitive person, and I don’t want to be the slacker in the class that can’t keep up. Even if you don’t have a gym membership or classes available in your area, you can still find ways to switch up your routine, by alternating between going or a walk or jog, riding a bike, doing a workout video, or doing toning exercises in your living room (you can find articles like this one all over the interweb). Right here was where I wanted to insert a photo of my iPod, but my camera’s batteries are charging, and we all know what an iPod looks like, don’t we? But it brings me to my last tip – Bring great music for your workouts! 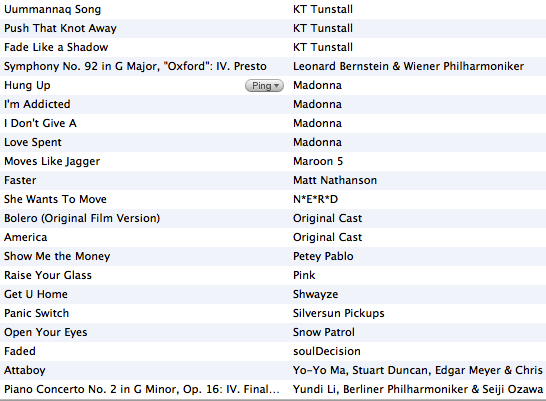 I keep a “Workout” playlist on my iPod. It’s not a terribly long list – about 25 songs or so, but I’m constantly moving songs on and off the list, because I get sick of songs quickly. Right now, the new Kanye West song keeps me moving. 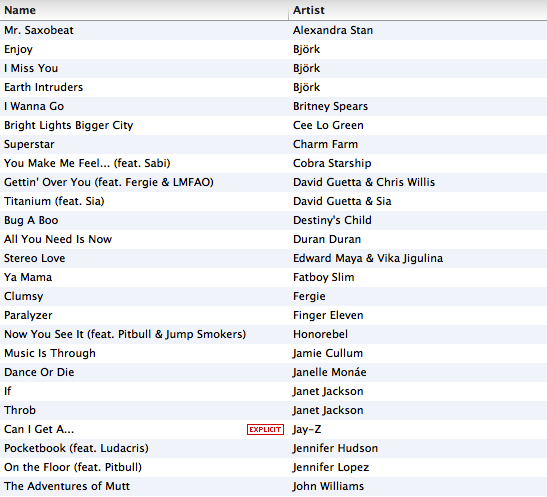 And last week, I added Gwen Stefani’s “Wind It Up” back onto my workout playlist. I had forgotten about that song, but it’s silly and bizarre and I get a kick out of it.